• 1,837 required a response from the fire department, CPR and was life-threatening. • 576 were classified as "dunkings" or near misses not requiring CPR. • Of the 1,837 life-threatening incidents, 1,369 occurred in a pool, 468 occurred elsewhere. • Of the 1,837 pool incidents, 914 involved victims who were younger than age 5. • Of the 468 incidents in another body of water, 231 involved victims who were younger than age 5. WASHINGTON – Gilbert dad Cody Thomson has a problem with pool-safety campaigns: the pool part. Thomson, whose then 6-year-old son, Brenan, drowned in a canal in 2011, said safety campaigns need to remind people that drownings and water-related injuries don’t only occur in pools. “If you get in a canal, unless there’s some sort of precautionary measure, there’s no way to get out,” he said. In a desert state like Arizona, it may seem odd that there are many ways to drown, but Thomson is one of many advocates in the state pushing for water-safety from any number of angles. A 2011 Arizona Department of Health Services report on water-related incidents from 1992 to 2010 said that 468 of the 1,837 incidents that required a fire department response did not occur in a pool. 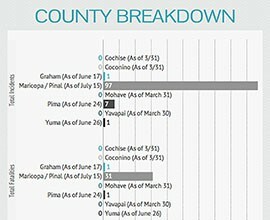 So far this year, Maricopa and Pinal counties have reported 97 water-related incidents and 31 deaths. Phoenix reported 36 water-related incidents as of July 1, including 10 deaths, six of which were children, according to the city’s website. Pima County reported seven incidents, one of which was a fatality involving a child. In Tucson, there has only been one water-related call this year, said Fire Department Capt. Barrett Baker, and it was non-fatal. “That’s the way we’d like to keep it,” Baker said. Children’s Safety Zone, a collaboration between hospitals, police and fire departments, reported one non-fatal incident each in Graham and Yuma counties this year. Lori Schmidt, president of the Drowning Prevention Coalition of Arizona, said that while this has been a fairly typical year for water-related incidents, she has seen an increase in emergencies involving kids 12 to 17 in the Valley. The Children’s Safety Zone reported six incidents involving that age group in Maricopa and Pinal counties this year. Four of those were fatalities. 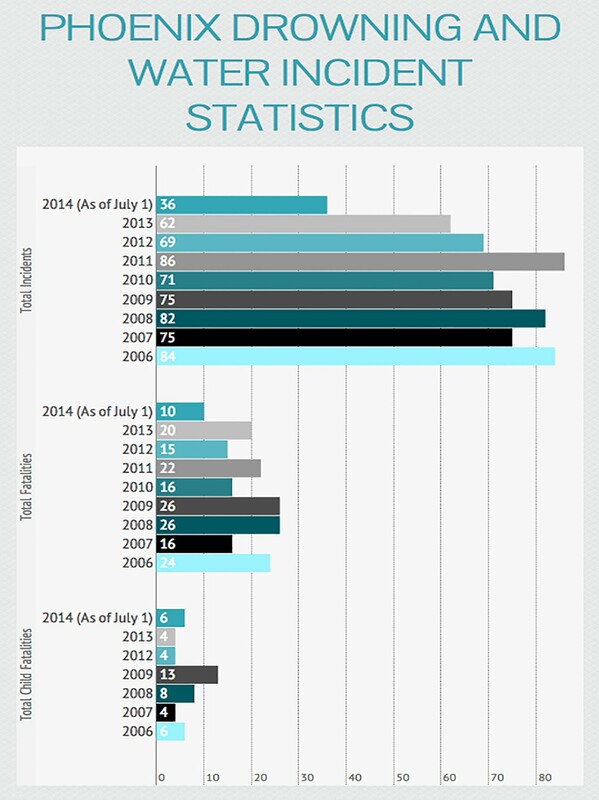 No deaths involving that age group were reported in 2012 and 2013. Schmidt also said boys tend to drown at a higher rate than girls and that drownings occur more often on weekends and holidays, when families are distracted. Schmidt agreed with Thomson that water safety needs to be practiced around any body of water in the state – and that safety measures do not vary from one place to another. 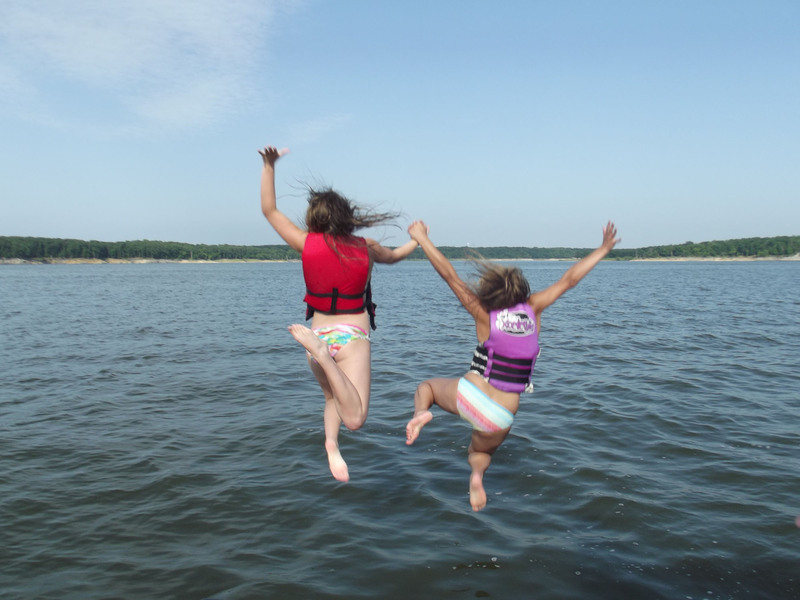 Parents should ensure that children know how to swim, and should consider putting kids in Coast Guard-approved life vests, even in the pool, she said, and not rely on water-wings, inner tubes or water noodles. 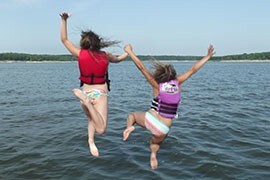 “Life vests aren’t allergic to chlorine,” she said. No matter where they are, Schmidt also warned adults not to swim alone, when impaired or feeling ill.
Kelly Liebermann, community education specialist with the Phoenix Fire Department, encouraged the ABC’s of water safety – adult supervision, barriers, and classes, both swim lessons and CPR. He said pool owners should not just rely on just a fence. They should also add alarms that warn when a door or window is opened and a sensor that signals if someone goes in the pool, to prevent what he calls a silent killer. All the advocates pointed to education as a critical element in preventing water tragedies. Tucson Medical Center and the YMCA have run more than 1,000 kids, ages 4 to 17, through a swim lesson program since 2012 that gives participants eight, 30-minute swim lessons and their personally fitted flotation device. “Since its inception we have zero known water incidents at the participating schools,” Mitchell’s email said. Education efforts will gear up in August, when Schmidt said agencies around the state will host safety events as part of the 10th annual Drowning Impact Awareness Month. The events are timed to remind parents that water-related incidents spike with distractions, such as the start of a new school year. But Thomson urges people to be alert at all times. 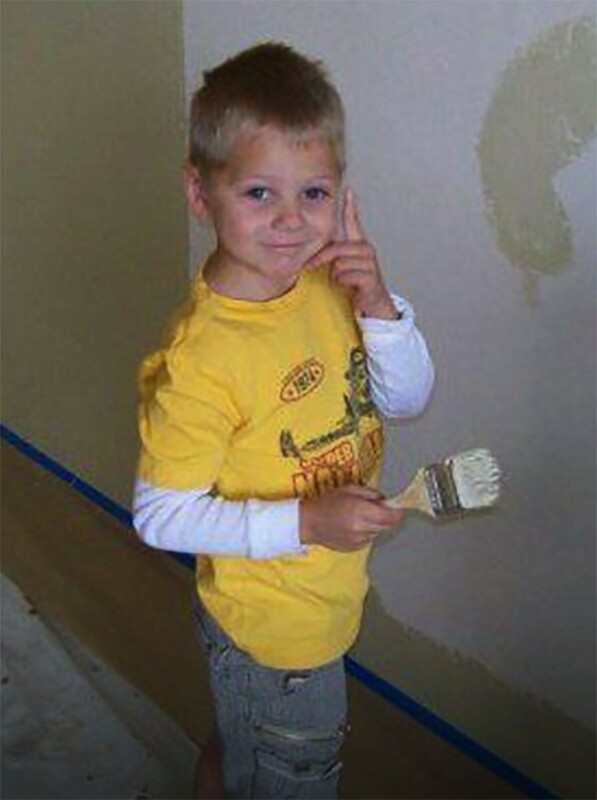 Since Brenan’s death, he has distributed water-safety packets in his neighborhood, urged other parents to be aware of nearby canals and worked with canal operators to push for more safety measures, like stairs to help people climb out. That becomes increasingly important, he said, as canal beautification projects attempt to turn canal systems into recreational areas. Planners need to think about safety, too, he said. Advocates say that water-safety lessons need to be observed in all bodies of water, including canals, rivers and ditches, and not just swimming pools. Life vests like those used by the children in this Missouri file photo should be used, they say. 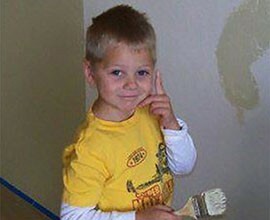 Cody Thomson's son, Brenan, was 6 when he drowned in a canal near the family's Gilbert home in 2011. The incident prompted Thomson to push for water-safety regulations to be extended to the state's many canals. 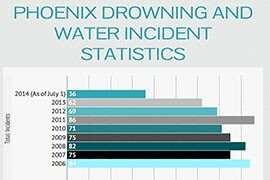 The city of Phoenix reported 36 water-related incidents, including 10 drownings, so far this year. Of the 10 deaths, six were children. The numbers are fairly typical when compared to recent years, according to statistics from the city's website. Numbers from the Children's Safety Zone show Maricopa and Pinal counties reporting more water-related incidents than other Arizona counties. 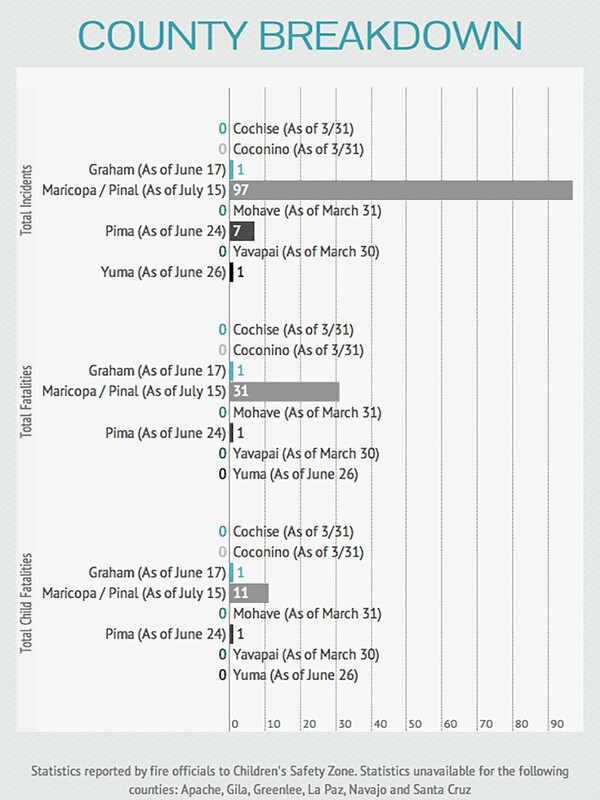 The number also show Pima County with seven incidents and one death so far this year.